Whatever a color a tonality would be according to your imagination, but musicians say that there are two tonalities to describe the scales in music. First and the most important tonality is all about the major scales, and the second tonality is all about minor scales. Up to now I’ve learned how to construct any major scale in Western music’s doctrine, but don’t ask me about the minor scale construction just yet since I’ve yet to learn the essentials of minor scales. Anyway, to construct major scales according to Western music’s doctrine, we need to know the pattern of whole steps and half steps in a pattern. Basically, there is only one pattern of whole steps and half steps that we need to remember in order for us to successfully construct any major scale. The pattern is (whole, whole, half, whole, whole, whole, half). Furthermore, a C major scale does not have any accidental (i.e., sharp or flat), because C major scale utilizes only natural keys. If we know about piano’s keyboard layout, natural keys are the white keys. Except C major scale, all other major scales must utilize at least one accidental or more. To understand why this is the case, one just needs to apply the major scale’s construction pattern of (whole, whole, half, whole, whole, whole, half) to the piano’s keyboard layout (or any other musical instrument’s layout). C to D is a whole key step movement, because there is a half key step movement of an accidental black key (#C or C sharp) which sits between C natural and D natural keys. D to E is another whole key step movement, because there is (#D or D sharp) which sits between D natural and E natural keys. E to F is a half key step movement, because there is no black key between E natural and F natural keys. F to G is another whole key step movement, because (#F or F sharp) which sits between F natural and G natural keys. G to A is another whole key step movement, because (#G or G sharp) which sits between G natural and A natural keys. A to B is another whole key step movement, because (#A or A sharp) which sits between A natural and B natural keys. B to C is a half key step movement, because there is no black key between B natural and C natural keys. The series of key step movements that I posted above is for C major scale of course, but I did not include the repeat of a C key to end the whole series as an octave. Nonetheless, we all know when a major scale starts out with a key note, to end an octave it should end with the same key note. For a C major scale, we start out with key note C, and to end the C major scale octave we should end it with key note C. The key note C that ends the current octave for C major scale should start a new octave which begins with this very key note C for C major scale. Remember, half step is one key up or down from the original key, and whole step is two keys up or down from the original key. Since the pattern of major scale is according to a series of whole and half steps, thus any other scale, except for C major scale, must use some accidentals (black keys on the piano) in the construction of a major scale. By following the C major scale pattern of the series of whole and half steps accordingly, one can see how a finger should place on each key note in a series accordingly. Thus, it’s important to remember when one has to play at least a black key (accidentals) in a scale, it’s not a C major scale. With major scale pattern knowledge, it’s easy for anyone to construct any major scale. According to what I’d read from books and watch videos from YouTube, people suggest that all major scales are very important. They think all major scales are the DNA of music, because all other scales derive from major scales. Perhaps minor scales derive from major scales? I don’t know about minor scales yet, so I guess I’ll talk about minor scales when I finish minor scale lessons. So, any major scale starts out with a note label should end with the same note label. For an example, a C major scale starts out with C natural, and so it should end with C natural. Thus, D major scale starts out with D natural and ends with D natural. If I’m not wrong, each scale should form a complete octave. Now, the question is why one needs to know any scale? I guess and if I’m not wrong, from playing the piano perspective, knowing a scale can help a piano player to move from one octave to another while preserving the tonality color. For an example, one octave higher can be played by the same notes in the same scale such as C major scale, yet preserving the same tonality color such as how things sound similar. Also, knowing the scales by heart, this I’ve yet to achieve, may help one to remember all the notes on a specific musical instrument. I notice that the notes in any scale do play nice and sound nice in whatever series. By this I meant when you play any note in a specific scale in a series, the notes come together nicely in a series of sounds. For an example, you can try to play a C major scale, but you can intentionally try to insert a non-member scale note into a C major scale without any careful thought — the series of sounds might come out unpleasant. Of course, there is always an exception, thus with careful thought and listening, one might be able to form musical piece with notes that are not sync in any scale and yet such musical piece sounds totally awesome and sweet. I guess, knowing scales can also help one makes music easier, because one can always fall back onto a scale! Of course, there are other important keys that I’ve probably missed in pointing out why knowing any scale is important for knowing music, but I sure hope the keys I point out would help you a lot already! By knowing how to construct major scales, it probably will be very useful for you in learning how to read key signatures. I’m still trying to learn more about key signatures. 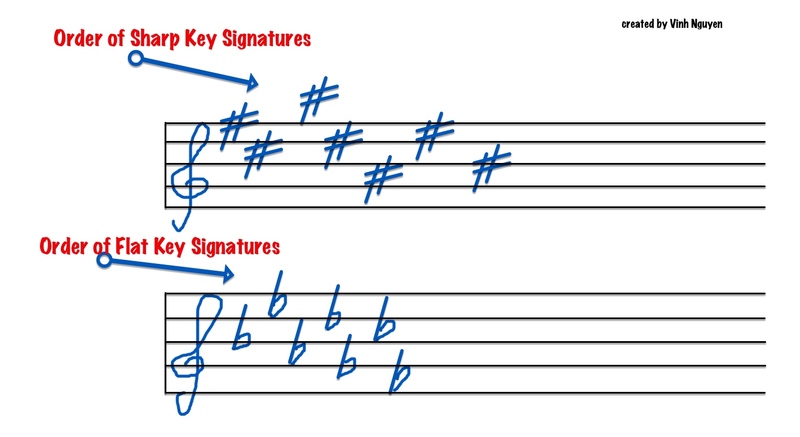 When I attain enough knowledge on key signatures, I’ll post another blog post on key signatures. For now, major scales are all that matter! Perhaps, you may not totally know what I’m talking about in this blog post in term of major scales for whatever reasons, then the YouTube video which sits right after the break may help you understand better at how to construct any major scale. This YouTube video isn’t mine, but I’ve found it on YouTube. I think the video is quite helpful in helping one to understand the construction of the major scales. Enjoy!!! To learn about half step, whole step, sharp, flat, natural, and scale, it’s kind of easy for me to use piano’s keys to do so. Perhaps, I’m not familiar with any other musical instrument, thus learning about the things that I just mentioned through piano is natural since I’m a bit more familiar with the piano than any other musical instrument. Anyhow, if you like, read on to see what I’d learned about the half step, whole step, and so forth. Looking at the piano, there are white keys and black keys. The white keys are known as natural, and the black keys are the sharp or flat. The black keys are somewhat confusing since each black key can be either sharp or flat, depending on how we want to describe it as an adjacent key of a white key either to the left or the right of the black key. For an example, C natural which is the white key can be increased in pitch by a half step if #C is used, but bC can also be used to decrease the C natural’s pitch by a half step. bC? The symbol for flat is somewhat resembling to a small letter b, thus I’m using b as a flat symbol. #? The sharp symbol looks like a number sign. I sneaked in the half step without explaining it, but it’s simply meaning that an adjacent key to any key is a half step movement. This means a whole step is a key farther away from the adjacent key. If you look at the piano layout, the bC (C flat) is not a black key but a white key, and this white key is a B natural. In a sense, any key on the piano can be either flat or sharp, depending on the relativity of the adjacent key in term of how we want to describe a key movement. Since the black keys are not the member of the C major scale, historically, they were used less and thus received less wear and tear, and according to Wikipedia’s quote above these black keys were black accidentally since they were made by black colored wood. Perhaps, this is why they are calling the sharps and flats as the accidentals, but I’m not sure. Anyway, C major scale isn’t the only scale in town, and so it cannot rule out that a half step lower from C cannot be a bC (C flat). Remember, bC is also a B. They have a name for this bC (C flat), and they call it as C flat natural. After all, the C flat natural is a B natural key. I mentioned that C major scale isn’t the only scale in town, because there are many scales out there. This is why we have to know the meaning of the scale! Regardless, I’m still learning on the scale part, and so I’ll be back with another blog post on the meaning of a scale or scales. What about leger or ledger lines? Have you ever wondered about the strange notes — with lines that sit above or below or strike through them — that sit outside the five line staff? These notes are there to indicate extra notes that the staff isn’t capable of fitting. When extra notes require, people use leger or ledger lines to indicate the notes’ positions. 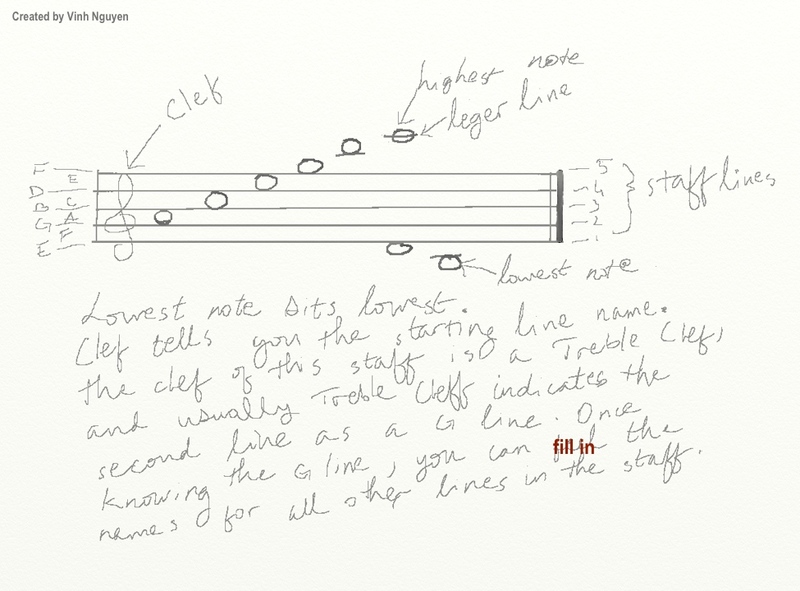 For an example, next higher line that sits above the 5th line of a five staff can be represented by a note that sits above or below a line (or a note gets a line which strikes through the middle of the note). Hint: five line staff can only have five main lines, thus leger or ledger lines are there to extend the five line staff. Leger can also be called as ledger line. What about Clefs? In theory, a five line staff can represent any group of line names, but this would be confusing isn’t it? Thus, people name common group of lines in a five line staff to certain clefs. There are couple common clefs, but there are other uncommon clefs, also. I won’t mention uncommon clefs here, but you can look them up on the Internet. The common clefs are Treble, Bass, and Rhythm clefs. You can search the Internet to see how these clefs look like. Nonetheless, a clef usually gets drawn to the very left of a staff. These clefs do look fanciful! Treble clef indicates that a staff starts out with line G on the second line, and people usually use Treble clef for musical instruments that can do high pitches (e.g., piano, flute, guitar). Bass clef indicates that a staff starts out with line F on the fourth line, and people usually use the Bass clef for musical instruments that can do lower pitches (e.g., drum, piano, etc…). Rhythm clef got no line name, because Rhythm clef is for a staff that represents musical instruments with no pitch such as percussion instruments. Usually, one line staff with a Rhythm clef is good enough for a single non-pitched musical instrument, but five line staff with Rhythm clef can be used to represent a set of non-pitched musical instruments in a song or a piece. There is no standard of how to name which line on a staff for which non-pitched instrument when it comes to a staff with Rhythm clef. Nonetheless, once you know a specific instrument position in a staff with Rhythm clef for a song or a piece, usually it means the line position of such an instrument on a five line staff won’t ever change (of course it may change on a new song or a new piece). When you see x marks on five line staff with Rhythm clef, it means the x marks are there to represent the small percussion instruments such as cymbals. To name the lines on a five line staff, you can use alphabetical letters of A to G (i.e., ABCDEFG). You name the lines on the five line staff in alphabetical order from bottom up. No other letter besides ABCDEFG can be used to name the lines on the five line staff. You can use mnemonic method to allow you to remember the line names of five line staffs that have common clefs. For an example, I use Empty Garbage Before Dad Flip mnemonic for lines on five line staff that uses Treble clef. In a five line staff with Treble clef, Empty represents name E for the 1st line of the five line staff, Garbage represents name G for the 2nd line of the five line staff, and so forth. I use Farting Always Causes Enemies or FACE mnemonic for remembering space names in five line staff with Treble clef. I use Goofy Babies Do Funny Acts mnemonic to remember the lines on five line staff with Bass clef. I use All Cows Eat Grass mnemonic to remember the spaces on five line staff with Bass clef.